If you’ve been following me on Instagram, you might have been seen me posting yoga poses for a week straight at a time. And maybe you had been wondering what was going on. 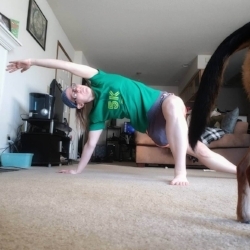 It’s been me participating in Runners Love Yoga challenges! What are these challenges? They are created by Ann Mazur (the woman behind Runners Love Yoga) to focus on a specific area that benefit runners. Some of the ones I’ve been doing have been hips and core, legs and backbends/twists. There’s a new pose every day to add into the flow and by the end you have a complete yoga flow to do whenever you want to. The best is, you can get a video of the flow (along with a written description) for each day of the challenge. It’s so helpful to see (and read) what I’m supposed to do, especially if it’s a new move. There are prizes to win (I’ve won once!) from awesome sponsors but what I love most is that it’s a quick flow that hits the spots that are most tight for most after a run. I can easily fit it in no matter how rushed for time I am since it hasn’t taken more than 5 minutes for me to go through each flow a couple of times. It also fun to try and figure how I’m going to post the pose for each day (part of the challenge is posting each day’s move to Instagram). Sometimes I’ve recorded the entire flow (speeding it up to fit within Instagram’s limit) and sometimes I’ve just taken a photo of the day’s move. Of course, Vinnie usually gets in on the fun if I’m doing it at home. If you want to join in on the next challenge, follow RunnersLoveYoga on Instagram to find out when the next one is! And if you do join in, tag me so I know and can cheer on you each day.